Sandra Jansen looks on as NDP Premier Rachel Notley speaks at Government House in Edmonton after Jansen was sworn in, on Oct. 17, 2017. An Alberta NDP cabinet minister who cited abuse and sexism when she crossed the floor from the former Progressive Conservative Party won’t run in the spring election, adding to the number of sitting New Democrat MLAs who won’t be seeking another term. Infrastructure Minister Sandra Jansen’s announcement on Monday came the same day another NDP MLA, Estefania Cortes-Vargas, also said she wasn’t running. That brings to 10 the number of current or former New Democrats not running, either because they are leaving politics or because they’ve left the party. The list includes another cabinet minister, Brian Mason, as well as Speaker Bob Wanner. The departures, which include MLAs in Calgary ridings where the NDP won in 2015 for the first time, come ahead of a spring election that will see the United Conservative Party (UCP) under Jason Kenney attempt to unseat the New Democrats in what is expected to be a difficult race for the government. The NDP also lags the UCP and the Alberta Party when it comes to nominated candidates. Ms. Jansen, a former television journalist who was first elected as a Progressive Conservative in 2012 and crossed the floor in 2016, released a statement that her decision not to run again came after consulting her family, although she did not elaborate. Her office declined an interview request. “Let me say, this is not an easy decision. But after many years in public life, it is the right decision for me and my family,” the statement said. 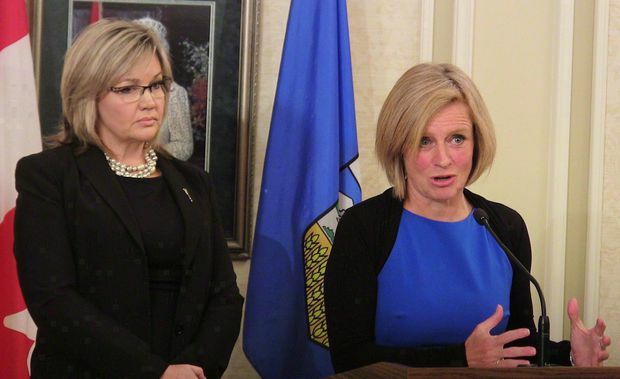 The statement expressed full support for Premier Rachel Notley and Ms. Jansen said she would work to help the New Democrats get re-elected. Ms. Jansen left the Progressive Conservatives in the middle of a campaign to lead the party, citing abuse she received during the leadership race and warning that her competitor Mr. Kenney, who ultimately won before overseeing the merger with the Wildrose Party, would take the party too far to the right. She was sworn in as Infrastructure Minister the following year. Aside from Ms. Jansen, the other NDP MLAs who aren’t running for re-election include Ms. Cortes-Vargas; Mr. Mason; Mr. Wanner; former education minister Stephanie McLean, who resigned her seat earlier this month; Brandy Payne; Jamie Kleinsteuber; and Michael Connolly. As well, Robyn Luff was kicked out of caucus last year, while Karen McPherson crossed the floor to the Alberta Party in 2017. Ms. Cortes-Vargas said she was leaving to pursue other professional opportunities and brushed aside any suggestion that it was related to her party’s electoral chances. She represents the Edmonton-area riding of Strathcona-Sherwood Park, which was reliably Conservative before the NDP’s 2015 victory. The premier’s office declined to comment on the departures, instead referring to Ms. Jansen’s statement. Seven UCP MLAs won’t be running again, including Wayne Drysdale, Pat Stier, Dave Schneider, Scott Cyr and West Taylor. Wayne Anderson was defeated in a nomination race, and Rick Strankman left the UCP caucus this month to sit as an independent. Duane Bratt, a political scientist at Mount Royal University in Calgary, said the level of attrition in both major parties is similar if you also consider MLAs who resigned in the years following the 2015 election, including former Wildrose leader Brian Jean; Dave Rodney, who resigned in 2017; and former premier Jim Prentice, who subsequently died in a plane crash. Mr. Bratt said more significant is where the NDP has moved high-profile candidates. For example, he noted Finance Minister Joe Ceci and Justice Minister Kathleen Ganley have moved to Calgary ridings that appear to be more favourable to the NDP than where they were elected in 2015.